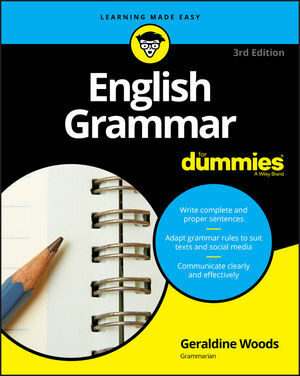 Grasping the intricacies of the English language doesn't need to be tricky, and this down-to-earth guide breaks everything down in ways that make sense—Revealing rules, tips, and tricks to eliminate confusion and gain clarity, English Grammar For Dummies gives you everything you need to communicate with confidence! Good grammar lays the foundation for speaking and writing clearly. This easy-to-follow book will help you become a more articulate, effective communicator. Covering everything from the building blocks of a sentence to those pesky rules of punctuation, it offers the practical guidance you need to communicate in a way that would make any English teacher proud. Geraldine Woods has more than 35 years of teaching experience. She is the author of more than 50 books, including English Grammar Workbook For Dummies and Research Papers For Dummies.